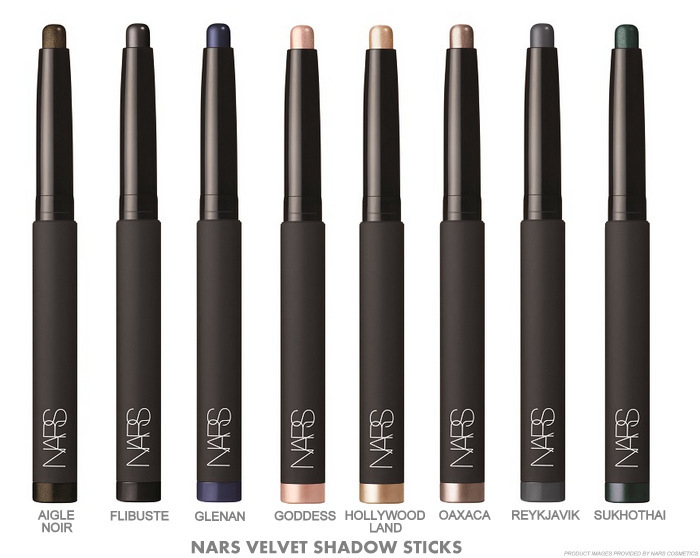 Making its official launch as part of the NARS Fall 2015 Makeup Collection is the Velvet Shadow Stick - a silky, velvety shadow in a twist-up pencil format and available in a range of rich colors for layering under and over, blending and setting, creating looks that are modern and sophisticated. Cream eyeshadows - sticks as well as the more traditional pots - are making quite a comeback now with almost every fall collection having a version of these. NARS Velvet shadow sticks are similar to the Bobbi Brown Long-Wear Cream Shadow Sticks in their packaging design but the colors in the NARS version are a lot more geared toward rich, bold makeup looks, though there are a few neutral shades too. Here's a look at the swatches. Overall, I think these NARS Velvet Shadow sticks are a welcome addition to the brand and definitely do seem better than the NARS Soft Touch Shadow sticks (won't stay on for a minute on my lids - I hate). 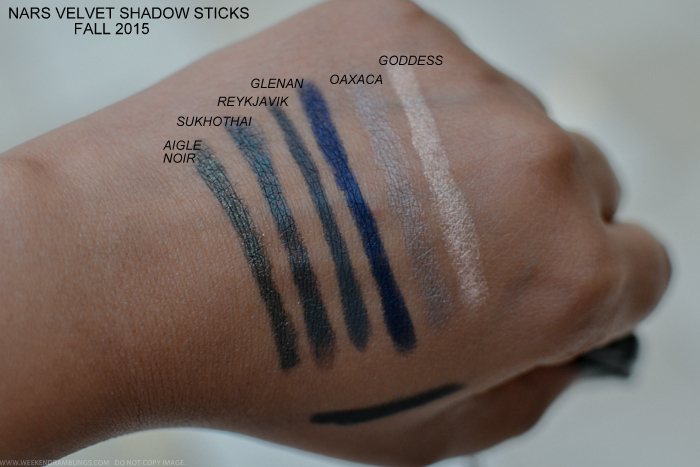 Going by how resistant the swatches were to a makeup remover, I would think these newer shadow sticks are great for use as bases, under eyeshadows for adding depth and dimension to the makeup look, and perhaps even used on their own. 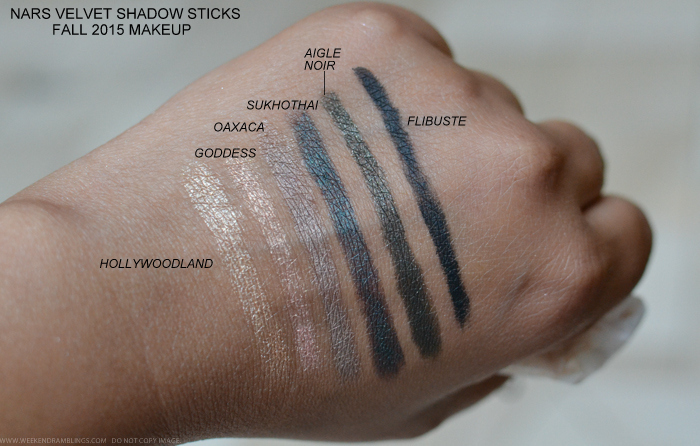 Flibuste - the matte black shadow stick - seemed a bit dry and difficult to apply, but that could just be the tester. If you like the cream eyeshadow format and prefer the convenience of a twist-up pencil, then do give the NARS Velvet Shadow Sticks a try. Not part of the Velvet Shadow Sticks collection, but NARS has also released a new black eyeliner pencils (to go along with the new NARS Audacious mascara) - Minorque. 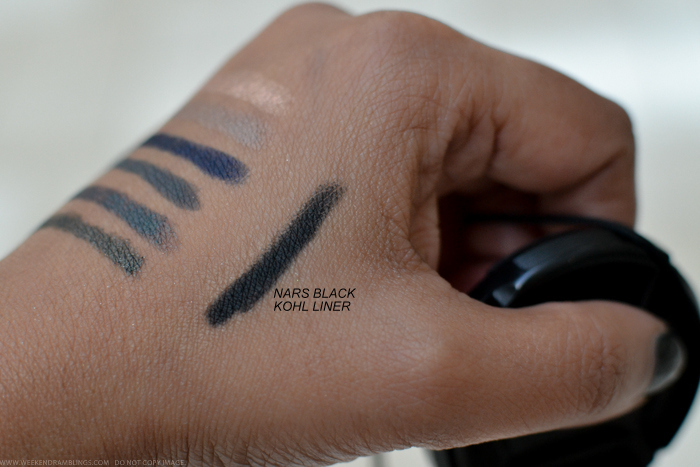 NARS Minorque Kohliner - a twist-up black eyeliner pencil along with a brand new Audacious mascara. The eyeliner pencil is a deep, dark, matte black.